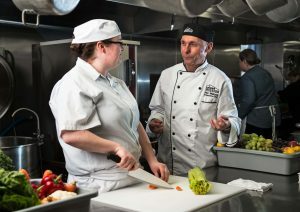 Join us for a special celebration on Thursday, June 22 @ 1:30 p.m. in The Ottawa Mission dining room as we recognize the hard work of the men and women in the current class of our Food Services Training Program. The 5-month program teaches men and women on social services how to cook in a commercial kitchen. It also builds self-esteem and confidence, which are fundamental to an individual’s success. The participants in this program take courses in Workplace Hazardous Materials Information System (WHMIS), health and safety, food handling, standard first aid, and knife handling skills. They learn first-hand in a working kitchen how to prepare and present a variety of meals and spend the last few weeks of the program in job placement. For more information, please contact our FSTP Coordinator at fstp@ottawamission.com or call 613-234-1144, ext 339.